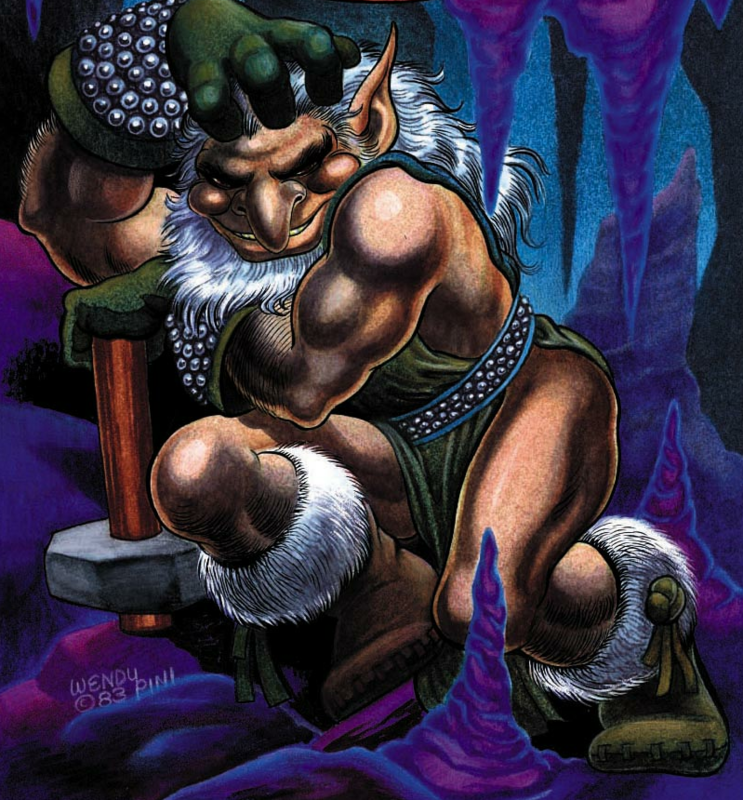 Born to an elfin mother and troll father, Two-Edge is unique even by elf and troll standards. Two-Edge’s young mind was split by his abusive mother Winnowill, when the youth threatened to go to Lord Voll and expose her wicked activities. Seeing Winnowill blast his father apart didn’t help his psyche much either. Somehow, Two-Edge escaped his mother’s cage but could not escape her influences. He and Winnowill played psychological games with one another for centuries. He became the disembodied voice that tormented her constantly. In an attempt to solve his identity crisis, Two-Edge set about to play the ultimate game, and engineered the troll-elf war for the Palace. Even crafting the sword “New Moon” to play a part. Two-Edge would lure, deceive, prod, and even steal dead bodies to force his hapless pawns to play their parts “right.” His game, however, did not go according to plan, and Two-Edge was left without resolution and severely injured. His history as an ingenious master smith, inventor, and teacher to the trolls, led Picknose to spare his life. Some time later, Two-Edge was discovered by the Go-Backs and taken in by Rayek and Ekuar. Ekuar had a calming influence on him during his brief stay in the Palace, and he agreed to take Rayek to Blue Mountain. Before reaching their destination, Two-Edge ran from Rayek, but still found his way back to Blue Mountain. During this time, Leetah and Two-Edge came face-to-face and she did heal some of the damage his mother had wrought. Unable to complete the healing, Leetah did awaken his elfin sending power. This was discovered by Clearbrook, after she ran him through. Two-Edge was Grohmul Djun’s “Master Builder”. And his desperate love/hate relationship with his mother caused him to be torn between helping and hindering the Wolfriders on many occasions. When the Djun beheaded his mother, Two-Edge was not entirely free of her influence. He became besotted with his “gentle maiden” Venka and his love for her seemed to give him some purpose in life and offered an alternative to the games he has played for centuries. After the Djun’s War, Venka left with the Go-Backs and Aroree on a search to find Kahvi, with Two-Edge accompanying them. He helped the Go-Backs resettle their ancestral home in the Frozen Mountains and lived beneath their lodge for decades, silently pining for Venka’s affection. He helped her answer the call of the Palace under the Wolfrider’s Holt, and ultimately stayed there when he learned of Venka’s plan to live in the Palace and possibly return to the stars. Two-Edge is now mentoring Treestump in the art of metal-smithing and exploring the pleasures of a lovemating with Ahdri.